I’ve been making final arrangements for my son to have his Bar Mitzvah at the “Masorti Kotel,” a part of the Kotel off to the side of the main Kotel Plaza that is known as Robinson’s Arch. This is the designated spot in the Kotel Plaza that allows for a mixed prayer group of men and women. How do I know the final arrangements are official? The rabbi of whom I am in correspondence with in Jerusalem cc’ed his email to “hakotel.” Yes, the Holiest spot to Judaism in the world was kept in the loop that my son will be called to the Torah in Jerusalem. Now it’s really official. There is no way of documenting in words what emotions my family will be experiencing when my son, his brother and sister, parents and both sets of grandparents along with friends and a few surprise guests will come to Robinson’s arch to pray in honor of Nathan’s Bar Mitzvah. We’ve been planning this moment since around his birth. 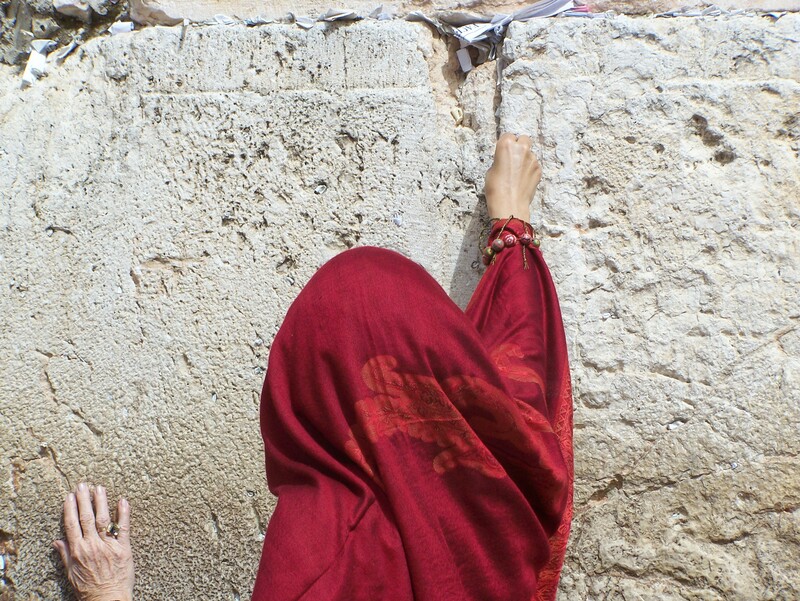 But this story goes back perhaps even farther, it’s a story of the power of prayer and placing a note in the Western Wall, and how Gd answers these notes in Gd’s own time. Once upon a time, a boy and a girl met one summer at Camp Ramah in the Berkshires. They met through mutual friends on a cracked tennis court. The girl kept missing every shot, and the boy didn’t seem to mind chasing all these balls and retrieving them for her. The boy really liked the girl. Loved the girl. But the girl just wanted to be friends. That winter, the boy visited Israel with his family. They visited the Kotel, or the Western Wall. The holiest place in all of Judaism where Jews for centuries pour out their hearts in prayer for a united Jerusalem, for a rebuilt Jerusalem. The boy wrote a note to Gd asking that the girl would one day fall in love with him, his family would be blessed with health, and (a bit of a more material and earthly ask), that he would make it into the Engineering program at MIT. Within a month of writing that note, the girl (who would be me) turned him down when asked to prom. Within a month, the boy’s sister became seriously ill with meningitis and lapsed into a coma. And, the rejection letter from MIT showed up soon after that. That boy felt like he was truly being punished by the Divine. Not to worry. Gd answers prayers. Just not in the instant we would like them to be granted. The sister of the boy recovered and thrived, went to MIT and went on to finish an MBA at Columbia University, has a tri-athlete husband and four beautiful children, and a thriving cupcake business! Nine years later the girl that turned down the boy for prom came around and they were married before 247 guests! The boy in the story is my husband. Whenever we are having an argument, or whenever my husband is getting on my nerves like when he doesn’t like the way I load the dishwasher, I think back to his note in the Kotel, realize that our marriage is meant to be by Gd, so I let it slide. Now, I’m going back to the Kotel again, the fourth time in my life. No two trips to Israel or the Kotel are ever the same. Each time you go there, you are a different person perhaps at a different phase in your life. So, I’m going not only with my family, but I will also be going as a messenger taking along the notes my students wrote to place in the Kotel. As my students started their note writing, they had many questions: How will Gd know it’s me? What should I write? How long does it have to be? Can I ask for anything…. anything? Is this a wish, or is this a prayer? And, will it come true, what I ask? How do they keep all the notes from falling out of the cracks?” …. and so on. I guess this is a lesson to myself that it is hard for a child to know exactly how to compose a prayer of one’s own to be placed in such a holy place when one has only an abstract concept of the place itself. These students have only the most fledgling connections with Israel, let alone an understanding of the emotional impact that a united Jerusalem, and access to Judaism’s holiest site, has on the Jewish psyche. But they did their best, and I answered their questions as best as I could. A note in the Kotel can express thanks to Gd for the health of family and friends. A note to the Kotel can ask to heal broken friendships or relationships. A note to the Kotel can ask to be provided for, and to never know hunger but one should not ask for “Lots of Money and an iPhone.” A note to the Kotel can ask for world peace and haters of peace, for their plans to be destroyed. But a note should never ask for the death of your enemies, let alone a family member. Gd is not your hitman. These notes will not be placed, nor do they deserve a place in such a holy place. This time of year, Americans everywhere are shopping and carefully wrapping gifts picked out for those special someones in our lives. Odds are, if that special someone is a teenager, that Christmas or Chanukkah gift, I’m talking the big-ticket item, will come with a screen. Last year, my husband and I bit the bullet and begrudgingly gave our adolescent children a laptop. We rationalized that the laptop was a necessity for homework. Our children get assignments that have to be completed at online websites like Pearson’s Successnet. We further rationalized that the children would want to send the occasional email to a friend. Furthermore, we told our children the laptop was to be used in a common room like the kitchen. But, laptops being what they are, and teens being who they are, my kids inevitably used their gift to chat with friends in the privacy of their rooms behind closed doors. There are many pros and cons to this virtual social life. Through Facebook and Skype, my kids share their daily minutia with faraway friends without running up my phone bill. They will never know what it was like to have to wait until late at night for the phone rates to go down to place that long distance call. Just one generation ago, having a phone line in one’s own room caused concerns for parents. Remember hiding under the covers with the phone? Now, the Internet is the place where parents of teens feel like they are losing control. Will they become vulnerable to online bullying if they are not savvy to the nuances of social networking? Will one wrong click result in viewing inappropriate web content? 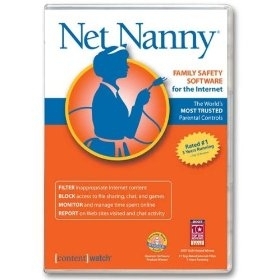 In a last-gasp effort to maintain some control of my kids’ online activities, I hired Netnanny. This is a content monitoring software program that allows parents to use customizable filters to monitor where kids can go online. Parents can also use Netnanny to put limits on Internet time. You can set how many hours a child can use the Internet, and what times of day these hours are to take place. If you don’t want your kids on the Internet after 10 on a school night, Netnanny shuts off Internet capabilities after 10 p.m.
One day, she wanted to go online to search for ski equipment on Dicks Sporting Goods’ website. Netnanny blocked her because the retailer also sold guns for hunting. Reason for blocking: possible violent content. When she wanted to do some online window shopping for some bathing suits on Landsend.com, Netnanny again pulled her back by the apron strings. This time: risqué sexual content. On Land’s End. Sure. When she needed to research a paper for social studies about racism, she could not enter certain sites because they contained “hateful language.” or images of swastikas. Finally, Netnanny blocked my daughter from Skyping with a friend in Israel. Perhaps the program detected a Middle Eastern ISP address and determined it was thwarting some kind of terror plot. I did find Netnanny’s monitoring reports useful in terms of tracking what she and her Facebook friends were chatting about. However, Netnanny was a bit too overprotective when she deemed that “Hiya Hon, Luv ya” written by one of her BFFs was considered sexually explicit language. He could play no games on miniclips.com. Wait, that was my intention. Miniclips always spread viruses on my computer and I find these games to be a complete waste of time. But, in an attempt to play an innocent game of solitaire, my son was blocked. Why? The game involved the use of cards: potential for online gambling. In my defense, I did block video games, but barring a game of solitaire was going a bit too far. My son is an avid guitar player. Often, he looks guitar tabs up to play the latest song he hears on the radio. But Netnanny blocked guitar tab websites. The reason: Music and entertainment, may have explicit language. After a few months, Netnanny disabled and corrupted all of the laptop’s Internet capabilities. I needed outside help and turned to Microworx, a Brighton information technology company that specializes in computer troubleshooting. It took several days and about $200 to free my computer from Netnanny’s clutches. When I called the company to ask for a refund, Content Watch, the maker of Netnanny, refused because the software’s warranty had expired. In the end, there is no substitute for giving your teens a good lesson in common sense, social networking etiquette and harsh warnings about not trying to search for anything illicit before you let them go online. Excuse me, Content Watch, if I was not a fortune teller and could not predict your crappy software would cause my computer such problems. In the end, we fired Netnanny. In the New Year, and the years to come, raising teens will come with many challenges. Now, it is navigating the information superhighway. Soon, it will be learning to drive on a real highway. The best I can do is to offer my guidance and always let them know that if they need me, I will always be on the other side of that closed door. I am writing to you somewhere within the American diaspora. In a few weeks, my husband and I will be taking our children and our parents on our first family trip to Israel. When we get there, I hope that the Israelis we meet there don’t think that we are devoid of any Judaism or Jewish life back in evil America. Let me explain. I just viewed some commercials made by the Israeli government warning them of the risk of assimilation, of losing their Jewish identity if they move to and remain in America. The Jewish Federations of America, along with most American Jews, took offense. A lot of controversy has been stirred by this ad campaign trying to lure Israelis living in America to come back home to Israel if they want their own children to remain Jewish. 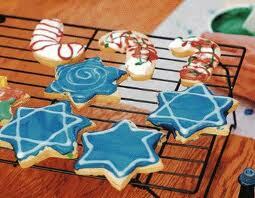 Here is what I know, good and bad, about Jewish life in America and Jewish life in Israel. Israel, you have no better friends in the world than the Jews of America. I am involved with the Partnership2Gether program in my city. Each time we are visited by our Israeli counterparts, friendships are forged and dialogues begin about Jewish identity on both sides of the sea. The Israelis making their first visit to America greatly admire how hard American Jews have to work to maintain our Jewish ties. Yes, we are pulled in many directions trying to balance secular commitments with the religious. But yes, we enjoy the freedom we have of making our own choices. The Israelis who came here greatly admire the role of women in synagogue life. Some of them for the first time saw women serving as rabbis. Some of them for the first time had the honor of being called to the Torah for an aliyah. Israelis who visited America expressed their disgust with extremist religious strains that take an “all or nothing” approach to observing mitzvot to the point that rather than trying to observe Judaism to their own comfort level, they have abandoned any Jewish practice at all. Yes, some of my middle-school aged Hebrew school students are from intermarriages. And many of them struggle with their identity, especially in December. But we have to respect that non-Jewish parents who love their children made the hard choice and the sacrifice to raise their child in a religion that is not their own. It is a choice they believe in and many try to learn about Judaism right along with their children. My students ask if they are a “bad Jew” if their family doesn’t light Shabbat candles every Friday night. They ask if they are a bad Jew if they help their non-Jewish parent set up Christmas lights. What can I possibly tell them? I can’t. All I can teach them are the tools and the mechanics of Hebrew language and the religion. It is up to the individual parents and families to apply or not apply, these teachings in the privacy of their homes. Am I a bad Jew if I find myself this time of year humming a Christmas tune? Not really, as Christmas permeates every facet of American culture between October 31 and December 25. For impressionable Jewish American children, it is all the more impossible to ignore. I teach my students and my own children that it is okay to admire the lights and decorations, but know it is not our holiday. Isn’t that after all the message of Chanukkah? I’m routing for this Science Mom: Vote for her today! Every now and again, I get a story idea in my inbox that just cannot wait a week until it is published in my column. In our age of overtesting our children to the point of desparation where they even cheat on college entrance examinations, here is a story of Melissa Gertner. Melissa is a mom who was inspired by her son’s curiosity to solve problems by tinkering with old machine parts in his basement to start an after school club called FIRST LEGO® League that lights the spark of science and technology in tween and teen-aged kids in Victor, NY. She is competing for a scholarship to win $10,000 for the Victor school district to continue and grow the LEGO program for years to come in Victor. The answer is simple. I am a mom and an advocate. My son is endlessly curious and creative. He is always inventing things in the basement, taking machines apart to see how they work, reading about the way our world works, drawing his plans, bringing them to life, making a mess, starting all over again. Every day. All day. And he inspires me. To provide opportunities for him and others like him to find their very special and immensely valuable place our world. So, two and a half years ago, with the guidance of the Victor Intermediate School, another devoted mom and I started the Victor Intermediate School FIRST LEGO League (VIS FLL) Club, a 3 year after-school pilot program designed to capture students’ interest in science, technology and engineering. The program offers hands-on real–world learning experiences that reach beyond the traditional classroom. In our first year, we served 26 4th graders in a non-competitive format. In 2010, we took six teams of 43 4th and 5th graders to qualifiers. 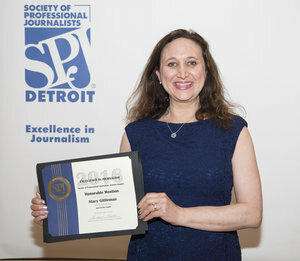 Three of those teams advanced to the Regional Championship. This year we will serve 80 students, including six teams of 5th and 6th graders attending the qualifiers in November and six teams of 4th and 5th graders participating in a non-competitive season starting in January 2012. How did I find my way to this program you ask. Well, three years ago, I had the privilege of coaching my son’s Jr. FIRST LEGO® League team. Little did I know, I had embarked upon the journey of a lifetime. Somewhere along the way, perhaps when I saw the pride in the faces of my son and his teammates at their show and share event or the incredible ideas they generated or the solutions these 8 year olds developed, I was hooked and committed to providing a continuum of science and engineering opportunities to as many students as I could possibly embrace. Since that time, I have coached his FLL team for two more consecutive years, been a co-coordinator for the club in the off-season and am currently the coordinator of the VIS FLL Club. I have also actively helped other teams get started in our region by sharing information, resources and encouragement. I continue to be inspired by the imagination, ideas, teamwork and passion these kids generate. Not only do our students participate in community events and competitions, they also mentor local students and others throughout our region, and spread the word about how exciting science and engineering can be. As much as I am helping to connect all these kids with science, technology and engineering experiences, they are the true connectors, connecting me with the best of myself and the best of themselves with our world. My son came home at the beginning of November with his first serious take home project in his academic career. To thoroughly research and display a natural landform. Your child comes home with a project assignment. They must research a topic and then display their findings in a creative way. Suggestions included making a diorama, a puppet show, a video dramatization. The project instructions come with a rubric so the child knows just what the teacher will be looking for in the research, delivery of facts and visual presentation before giving the grade. In true tradition of thinking in terms of our achievement and perfection driven culture, as demonstrated in the film Race To Nowhere, I initially got it into my head that this was not my third grader’s project, but it was mine. It would have to be mine if I was to make sure my son got the highest grade possible. I couldn’t just let my eight year old go it on his own, could I? Because other parents in my highly competitive school district wouldn’t just hand off their kids project, would they? If I let him do this on his own, would I seem neglectful? Would I come off as apathetic mom in a tiger mom school district? Right away, I approached the project – Rivers – like the 40something I am and not like the eight-year-0ld child that my child is. As far as the research, I would visit three different library branches to take out every children’s nonfiction book on rivers in publication. The research went well and with much enthusiasm, my son, with some direction, came up with vocabulary flashcards with river terminology like “mouth” and “source” and “delta”. 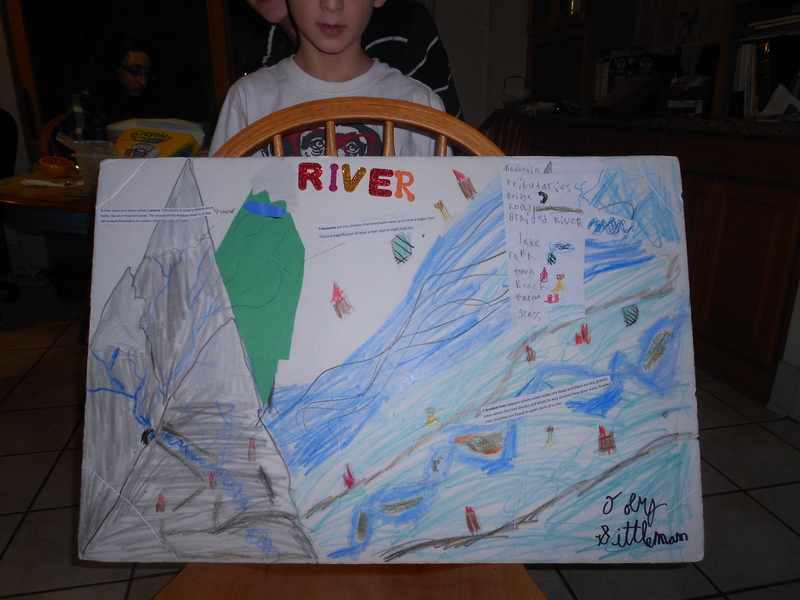 He also created about six flashcards with facts on the world’s longest rivers and New York State rivers. To top it off, he wrote the flashcards showing off his latest 3rd Grade skill: using cursive letters! All these ideas were shot down during the design conceptualization meeting with my son. Really? Just Color? Would there be an initial sketch? How would a sense of scale and perspective be achieved? The more suggestions I made, the madder he became until he started to cry. Remember, this was supposed to be an enjoyable project to be completed at home. Three days later, he came home with his final grade: Outstanding. Well, good for us. I mean, good for HIM! Ever since my daughter started high school, I don’t see her that much. She doesn’t talk to me that much either. She is either in school, at practice, or up in her room studying, texting or skyping. So, when she starts talking to me about taking on a new challenge like cross-country skiing, even though it’s a language almost foreign to me, I had better listen. I tried to downhill ski, once. It was in California on a weekend away with my husband’s grad school buddies. Long ago, on a bunny hill somewhere in Lake Tahoe, Calif., I decided that strapping waxed wooden pieces to my feet and then surrenduring my body to the mercy of gravity was simply a horrible idea. I was better suited for a flatter, more level playing field. So, the next year, I attempted cross-country skiing. I thought, how hard could it be? There are no hills to hurtle down and cause bodily injury. There are no ski lifts to try to jump on. Again, my new husband and I headed to Lake Tahoe for the weekend. It was a perfect, fresh-powdered blue-skied day to take my first five-mile trek on cross-country skis. I could run five miles at a time, so how much harder could skiing it be? Any ability to get my poles and my arms in rhythm with my feet in my skis completely escaped me. As soon as I would get any momentum going, I’d topple over into the snow. After falling over for about the 72nd time (I’m not exaggerating), I just sat there and wept in frustration. I took off my skis, walked back to the lodge and had a hot chocolate while the others effortlessly glided along the lakeshore. So, when my daughter came to me with those big blue eyes sparkling with the promise of a new challenge, I was not going to put my failure on the slopes and the trails on her. But how much was this going to cost us? We head out to a ski swap and sale at a middle school surrounded by farmland. This is one of the biggest ski swap and sales in the area, and the gym is packed with parents like us shopping from the area’s ski retailers. Thankfully, the high school ski coach is there to teach us the lingo (Classic skis, Combi skis and boots, Poles, Bindings.) and show us what we needed to buy. We need skis that she can use for both disciplines. No, the two disciplines are not scary downhill and frustrating cross-country, as I thought. There are actually two disciplines of cross-country: classic and skate. About 40 minutes, — and hundreds of dollars – later, she had what she needed to hit the trails. 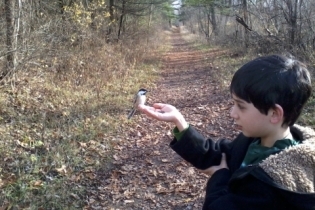 On the way home, we stopped at one of our favorite places to hike, Mendon Ponds Park, where my kids have been hand feeding the chickadees since they were little. It is one thing they still like to do and each time a bird lands in their hand, I get a glimpse into the past, see the little kids my big kids once were. My daughter brings her poles along for the 2 mile hike, just to get a feel for them. Then, out of nowhere, my daughter wants me to give them a try. I listen to her and slip my thumb in the proper hole, adjust the velcro secure around the rest of my hand. Bend my elbows just so. 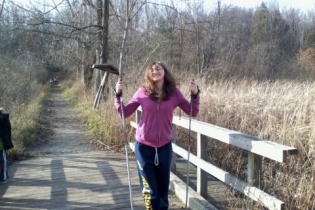 And, in one final hike before the snows fall, my daughter and I take turns with the poles along the trail. Together. Side by side. How much do I have to be thankful for as we approach Thanskgiving week, the week after my son’s Bar Mitzvah? First, I’m thankful for my husband for creating an excel spreadsheet to track it all, among other things. After weeks of not sleeping well, with millions of details running around in my head, I gave my permission this week to sleep in a bit. To become somewhat of a slacker. To laze in bed after the kids went off to school to read. To read chapters in The Hunger Games, a book my kids have been begging me to finish already after starting it two months ago. To read A Legacy of Madness, a memoir written by a college friend and forever mentor, who edited nearly everything I wrote at the college paper at Rutgers. In this way, I made a little room to thank myself for getting through a blessed and wonderful weekend that was Nathan’s Bar Mitzvah. Next week is Thankgiving, where we will thank everyone else. For friends and family for driving north and south, for flying east, to be with us in Rochester. For friends, who helped us prepare the gift bags for our out of town guests. For friends who are more like sisters who helped serve dinner on Friday night. For friends and family who read Torah, who learned an aliyah or took a reading during the service. For nieces and nephews who gave out candy, and then ate the candy, after we showered Nathan with sweets. Now that Nathan is a man (see above), it will be his turn to say thank you all for making his day so meaningful. And he’s going to thank you the old fashioned way, with a card to soon be apppearing in your mailbox. 101st Airborne Division during World War II. able WWII veterans on this trip. Honor Flights, including Hennessy’s friends Bill Ryan and Ted Vangellow. Hilton Hotel before their trip home. Iwo Jima memorial, a group of high school students sang ‘Amazing Grace’ to us. Glider Corps to fly supplies in behind enemy lines. however, had duties just as dangerous, but got no extra pay. helped set up camps in England in advance of the invasion of Normandy. weight of a tank driving over it. through, but they got out OK,” he said. Normandy, as well as on the frontlines around Dusseldorf, Germany. seaside resort city of Biarritz, France. opinion on the wars in Iraq and Afghanistan. 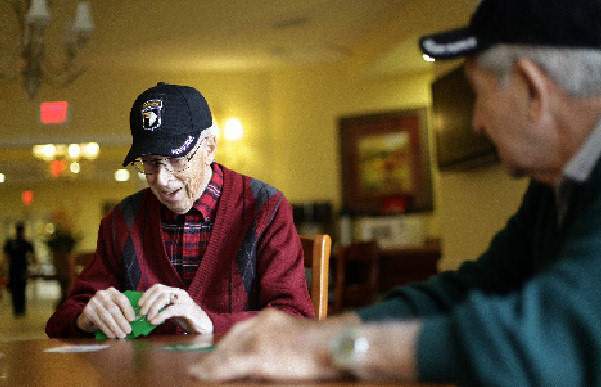 lost too many good people,” said Hennessey. The other morning I phoned my sister-in-law in northern New Jersey. I needed to know her Hebrew name for an honor she was receiving for the morning service at my son’s Bar Mitzvah, now only days away. Now, I should have known this, and certainly my husband should have known his sister’s Hebrew name, but we didn’t. I called her cell phone a few days ago after 8:45 in the morning. With four kids in school, she had to be up. She is always on the go. Instead, a very groggy voice answered. Oh, of course, that’s why I was calling. But why did she sound so tired? “Why arent’ you up? Don’t you have kids to get to school?” Fool that I was, with the glorious November day outside, and the fact that Western New York again survived the latest storm to hit the east coast unscathed, I was not thinking about how bad things were back in the NYC/NJ Metro area. The now-dubbed Halloween snowstorm had turned the streets of parts of New Jersey into what looked like a war zone. With downed trees and downed power lines, it was even too dangerous to go trick-or-treating. Sadly, even trees don’t last forever. 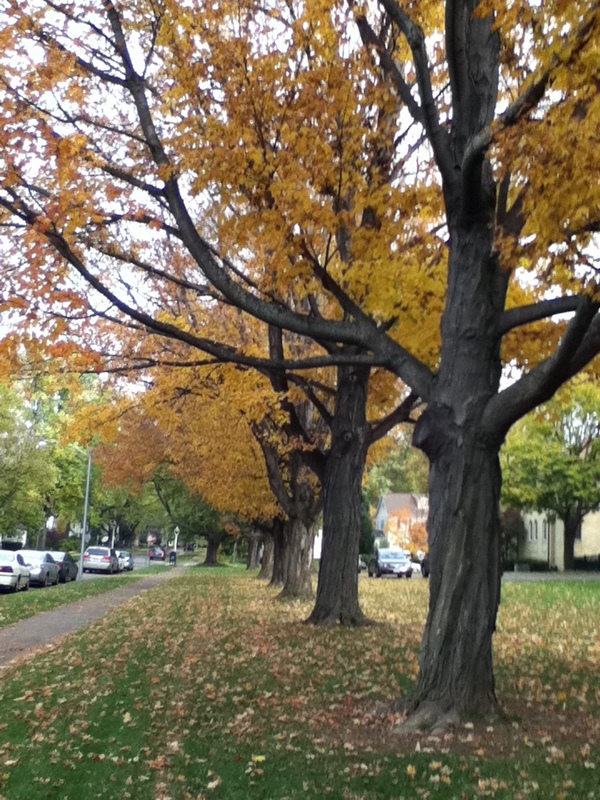 The snow-laden trees above were planted because they were fast-growing trees for Rochester’s first suburban development. They are now almost 90 years old. 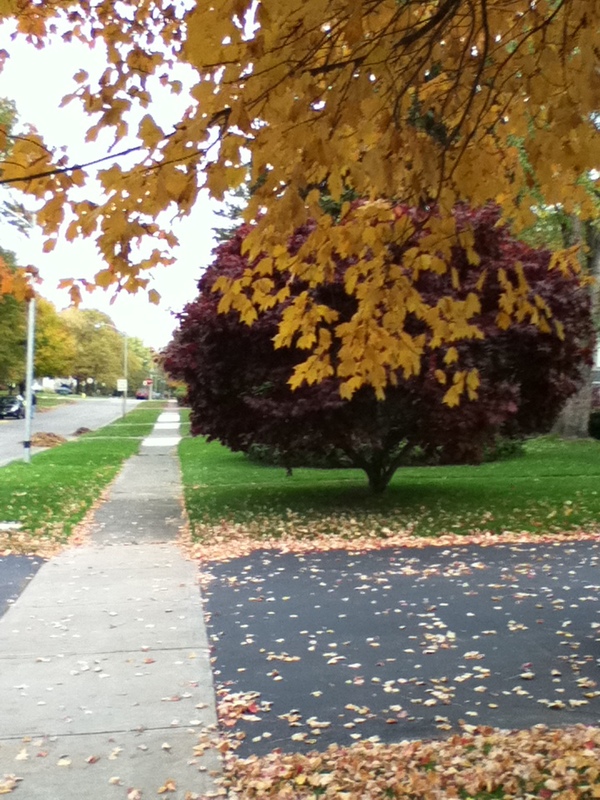 This tree saw 90 years of changes of seasons, survived ice storms and blizzards. It saw generations of school children off on their first day of school. It was a home to birds and squirrels who played in its branches. But it lived out its days and succumbed to “crotch rot” of all things. Now, where its branches once stretched out, there is a whole punched into the sky where it once stood. When snows fall heavy before the leaves drop, trees come down before they get a chance to live out their days. Back in New York City, Central Park lost 1,000 trees; trees that were just beginning to peak in their fall splendor of color. Trees that were planted generations ago so that we may enjoy them. The other week, my son got a gift from a relative in honor of his Bar Mitzvah. In the true Jewish tradition, a ring of trees had been planted in his name in Israel. It’s a good thing we are headed there this winter to water them! Now after this devistating storm that cancelled trick-or-treating and felled countless trees close to home, it seems like New York City needs new trees just as much as the land of milk and honey. The Central Park Conservancy is now asking for donations to restore its tree population. Do you have a favorite tree? How would you feel if it were destroyed or it had to come down? Or, did you lose a tree to the Halloween storm? If so, I am sorry for your loss. Why don’t you write about it here? If we knew you were coming… the art of the R.S.V.P. A friend of mine recently took on a community outreach job where she has to arrange free events for a local non-profit organization. The carefully targeted invitees are sent invitations both by snail mail and e-mail. The invitations are sent in a timely manner and indicate the event is free but space is limited and one must RSVP to attend. There is a handy email address to send a response, a mailer to mail back, and a website to also let the event organizer of ones decision of attending or not attending. At such a recent family friendly event, I watched my friend fly around the event venue in a panic. Around 25 families responded that they would be coming. Double that amount had lined up outside the door, waiting to come in. She feared she did not have enough forks or plates, or food ordered for the unexpected who showed up. Would she run out of craft supplies and disappoint some unsuspecting children. After all, it wasn’t their fault if their parents failed to R.S.V.P. And, in an event with a purpose to create inclusiveness, it would be wrong and off-putting to turn people away. Do you R.S.V.P. yes or no to every invite you receive? To an event planner, that yes or no response makes the difference between having enough pre-cut craft pieces or not having enough. It is the difference between having enough juice boxes for the kids whose parents responded or having to turn people away with kids who may have wanted to do a craft project and a juice box but didn’t respond and feeling badly about it. 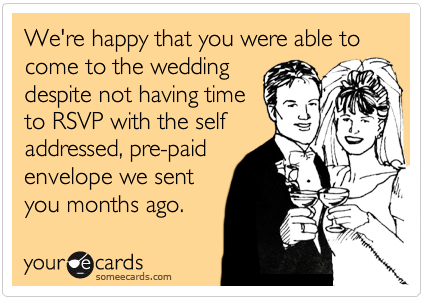 And, if you don’t RSVP to an event like a wedding that requires head counts by the caterer or table seating arrangements, you may quickly fall off invitee lists of the future. This problem seems systematic in my community, I wonder if this goes on everywhere. Are the e-vites that appear in our overloaded e-mail and social networking in boxes not as significant as the invitations that are mailed to us the old-fashioned way? Now, am I innocent of the crime of not RSVPing to something, and then showing up? Absolutely not. A few months ago, I had plans to attend what I thought was an informal learning session after Saturday morning services at my synagogue. What I, in my hurry in reading the email, failed to see that it was a LUNCH and learn, and one had to RSVP. As a result, I felt like a heel. An idiot. I had no premade name tag. No table tent had been carefully prepared by an administrative assistant who made ones for those who made it their business to RSVP in a timely manner. There was food. None of it was ordered for me. Because they didn’t think I was coming. So, I took no food. Not until after all the people who had the decency to respond had theirs first. Even though people said no worries, I should go up and help myself. No, I thought. I didnt’ RSVP properly. It served me right. So, if you get in your email or social networking inbox an event, remember there are people behind that invite who have a lot of details to take care of, budgets to stay within, name tags to print and a finite number of sandwiches to order. Even if you have to say ‘no,’ a regret is far more appreciated than no response at all.